How The N.Y. Yankees Maximize Response Rates. Telemarketing Restrictions - Story Update. Talk about tradition. No, not the New York Yankees winning pennants, Talon’s role in helping the Yankees sell merchandise through direct mail catalogs. 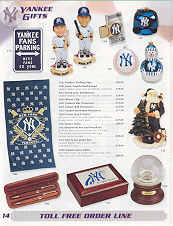 For the seventh consecutive season, Talon has mailed the Official Yankees Gift Catalog. You can gain valuable insight into how to increase your response rates by examining how the Yankees maximize theirs. One way to increase response rates is to find the times of year that work best for your product. The Yankees produce two catalogs and the mail dates are carefully planned. The first catalog is mailed right before opening day and the second catalog drops shortly before the Christmas and Chanukah holidays. If you are not sure of the best times to mail your promotion then it’s a good idea to test. Send small mailings at different times throughout the year then track and measure response percentages. Perhaps you will find that certain times of the year increase your response rates. Another way to make the mailing a perennial winner is to use lists that offer the best chance of success. 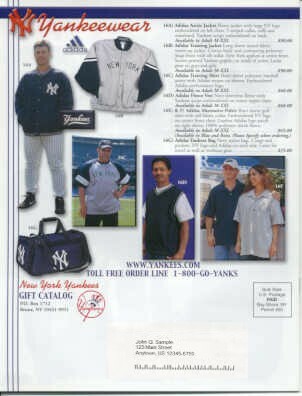 The Yankees use their mailing list of previous catalog buyers and current season ticket holders. Then they rent targeted lists such as Sports Illustrated and choose readers from the New York area. After Talon receives the lists we merge/purge them (this eliminates duplicate names that appear on more than one list) and perform an NCOA (National Change of Address). The NCOA is valuable since it updates mailing lists with new addresses when someone has moved. Last we sort for the lowest possible postage rate and then inkjet address and mail the catalogs. 1) An 800 Order Number is displayed on every page for credit card orders. 2) A Reply envelope and order form is attached to the centerfold of the catalog so the responder can mail an order using a credit card, check or money order. 3) A fax number is provided to fax the order form using a credit card. Can Internet orders be far behind? One last tip: The Yankees offer to send a gift card with a custom message placed inside the order. By providing this service merchandise can be sent as holiday or birthday gifts! Robert White our new employee was a United States Post Office letter carrier for 37 years. He retired from the post office this spring. Bob as he likes to be called had quite a career at the post office. Bob served as a union shop steward and was the first black letter carrier in Levittown New York. Before coming to Long Island Bob had previously delivered the U.S. mail to the Mount Vernon postal route where Malcolm X's widow Betty Shabazz and jazz icon Nina Simone owned homes. In Mount Vernon, Bob also coached Pop Warner football - one of his best players was future academy award winner Denzel Washington. When it was time to hire a new driver we interviewed many potential applicants. We knew that we were not just hiring a driver but would need an employee who would have many important roles. When we met Bob we knew we had found the right person. When you meet Bob you realize he is instantly likeable and a great person. This is an important attribute since Bob is the "face" of our company - often delivering and picking up materials from our clients. Another important attribute was Bob's years at the post office. Since he would be delivering our clients' mail to the post office he understood the intricacies of mail preparation. In the short time Bob has been with us he has been a valuable asset by providing input and perspective on mail preparation. Congratulations Bob on the fantastic article! According to the Washington Post, "in the year since the anti-telemarketing registry was officially launched, more than 62 million telephone numbers have been posted to the list, according to the Federal Trade Commission. As of Friday June 18th, 428,000 complaints had been filed against more than 130,000 companies said to have made telemarketing calls to numbers on the do-not-call list. About 200 companies are repeat offenders with 100 or more complaints each. Telemarketers risk a fine of up to $11,000 for each number they call on the list. about.com - Practical Advice and Solutions for almost any problem.